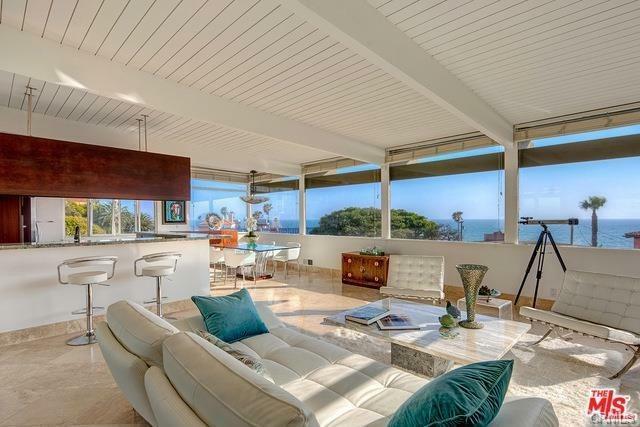 Wonderful panoramic ocean view mid-century modern beach house a block to the beach on Playa del Rey's coveted west bluff. With breathtaking ocean views from Palos Verdes to Malibu, this artistic architectural features high beamed ceilings, vast ocean view Great Room & walls of glass framing sweeping views of the coastline. Honoring the best of mid-century design, this casual, sophisticated beach house features a central atrium & outdoor room for easy indoor/outdoor living. Dramatic 2-story glass entry leads to spectacular sun-filled living space & designer kitchen w/sea-green stone counters, stainless appliances & vast breakfast bar. Serene master w/luxe spa bath & huge walk-in, spacious 2nd bedrm & 2nd bathrm, 3rd bedrm/den w/FP. Gorgeous gardens, patio & tiered yard w/views, direct entry garage. Sold by Justine Howard of Coldwell Banker Res. Brokerage.